Creating wax-ups for crowns, bridges and partial dentures, directly from digital files. Wax-ups for partial dentures have never been easier, or more precise. 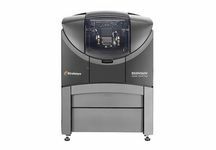 Stratasys FrameWorx is the highest-precision wax 3D printer available for automated production of partial denture wax-ups, so you can gain digital efficiency with uncompromising quality. Based on reliable WDM (wax deposition modelling) technology, it produces multiple wax-ups simultaneously in a familiar wax-like material that works with your normal investment-casting process. You gain digital accuracy and efficiency by running FrameWorx unattended day, night and weekends. It’s like adding an automated second shift to your model-making capacity, freeing your hands and mind for other activities. The system incorporates an icon-based user interface for intuitive programming and operation; no special design knowledge is required to run it. FrameWorx delivers the highest resolution in the industry (5,000 x 5,000 x 8,000 dpi) for reliably precise margin lines and occlusal morphology. Wax-ups can then be directly investment cast, with minimal post-processing. Create wax-ups for crowns, bridges and partial dentures, directly from digital files. Achieve high-quality casting with minimal post-processing. Produce the industry’s most accurate wax-ups with a resolution of 5,000 dpi on the X and Y axes and 8,000 dpi on the Z axis. Avoid shrinking, expansion, cracking and residue with WDM materials that burn away cleanly. Formulated specifically for investment casting in dental applications, WDM materials are safe and TSCA-registered, and require no special waste disposal. FrameWorx can create exceptionally thin-walled wax-ups, saving material costs, labor and finishing time. Plus, its large build plate can produce five partials a day, so you can eliminate hand-waxing and its associated costs. FrameWorx uses non-toxic WDM materials that burn away clean with no ash, residue, shrinking, cracking or expansion, and pose no biohazard or disposal concerns. TrueCast model material is firm but flexible, enabling you to 3D print any dental wax-up with extreme accuracy and superior dimensional stability. It’s 100 percent castable for any alloy. TrueSupport enables 3D printing of even the most delicate wax-ups, and melts away easily before casting.